"I'm not much into running American records in front of 30 people and maybe 20 trees. I think you need to be ready when it counts. ... I believe you gotta race. And I think you gotta race at the right time and be ready to go when it counts. If somebody runs an incredible time then they can't make the American team, that's bullsh*t!" - Coach John Cook talking to LRC co-founder Robert Johnson in a rare public interview that went for 73 minutes last night on LetsRun.com's live web radio show Training Talk. We highly recommend you listen to the interview that produced so many good quotes, we might have a Cook Quote of the Day for the next week. Glenn Latimer - Qualifying Standards Contradiction? NRR - Brittney Griner on OTL... another Semenya? Is work really just enslavement? 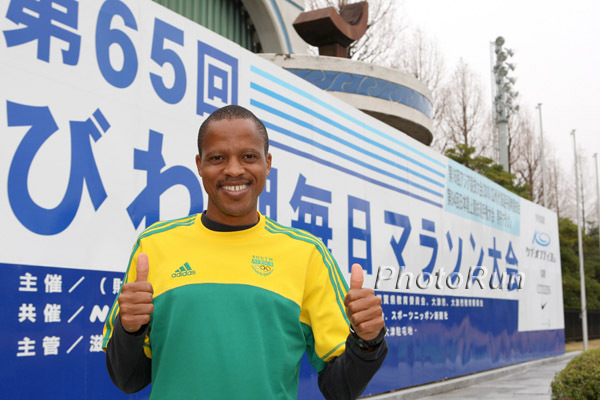 Japan's Oldest Marathon - Lake Biwa Marathon - Features Ramaala, Tsegay, Munyeki, and Top Japanese South African marathoning icon Hendrick Ramaala will race this Sunday's Lake Biwa Mainichi Marathon, Japan's oldest marathon. He will compete against 2008 Olympic 4th-placer Yemane Tsegay of Ethiopia, some solid Kenyans and 5 Japanese runners with PR's between 2:08:40 and 2:10:59. Daniel Komen Dares Kenenisa Bekele To Break His Record Komen wonders why Bekele talks in the press about beating his 7:24.90 indoor 3,000m world record. The Kenyan returns the favor with some bold words for Bekele. Kenenisa Bekele Again Scratches, Citing Injury For the 2nd-straight winter, injuries have slowed the world's best-ever track distance runner. Earlier this year, he pulled out of Birmingham and was beaten soundly in Edinburgh XC. Kenyans Choose Mateelong And Chepkurui As Team Captains While Coach Says Team Fitness Is At 65% The Kenyans are desperate to get their first men's senior long course title in 11 years. Kiprop Versus Willis Fizzles, Rudisha Drops 1:43.15 The highlight of the meet was supposed to be an Asbel Kiprop and Nick Willis 1,500m rematch. But Kiprop got clipped up and Australian Jeff Riseley was the winner in a more tactical 3:42.70 as Willis was third. David Rudisha, who ran 1:42.01 last year to end the season, got his 2010 800 season off with a bang in an Australian all-comers record of 1:43.15, as LetsRun viewer favorite Ryan Gregson was 2nd in a distant 1:46. Team USA Announced For World Indoors Starting March 12 The US will send over 50 athletes to Doha, likely the world's largest team. US mid-d and distance runners going to Doha: Anna Pierce and Alysia Johnson (800), Erin Donohue and Sarah Bowman (1,500), Sara Hall and Desiree Davila (3,000), Galen Rupp and Bernard Lagat (3,000), Will Leer and Garrett Heath (1,500), Nick Symmonds and Duane Solomon (800). LRC Comment: A First? Desiree Davila, a Hansons-Brooks runner, is representing the US on the track. She ran for the US marathon team at the Berlin Worlds and ran great to get 11th. LRC Exclusive Houston Marathon Trials Analysis: Follow The "Support" We talked to Ed Torres, one of the two athlete representatives on the USATF committee that awarded both the men's and women's 2012 Olympic Marathon Trials to Houston. We wanted to find out the factors that led to Houston being awarded both of the Trials. Opinion Divided: US Marathoners And Coaches Respond To "Houston x 2" Announcement Most of the runners don't seem to care too much who won and support Houston getting the Trials. Adam Goucher brings up a good point that the top athletes like Ryan Hall likely will give up a fall payday and a spring day to run the Trials, whereas in the past they would only give up one big payday. Plus a guy like Hall or Ritz might make more in appearance fees at a one marathon than they would from winning the Trials. *LRC The Inside Story: How Houston Beat Out New York For The Right To Host The 2012 US Olympic Marathon Trials Nine years ago, this once-proud race which had hosted the 1992 Olympic Marathon Trials and had Bill Rodgers as a former champion dropped prize money and seemed to be on its way to exiting the national stage. Now Houston is on top of the US running world. Read how it happened and get some more details on the 2012 Trials. Bekele Returns From Injury To Race In Lievin 3,000m - Meet Preview Kenenisa Bekele got smoked in his only cross-country race this year and has had a calf injury for two weeks - and the race spokesman is still saying Bekele will be going for Daniel Komen's 7:24 indoor 3k world record against Frenchman Bob Tahri. Our bet: not a prayer. BBC Announces Haile G Will Not Rule Out Road 10k World Record In May He's almost a 40-year-old marathoner. If he breaks the world record ... well, we better not make any outrageous cash guarantees; we would never do that at LetsRun.com. Steeple WR Holder Shaheen Doesn't Make The Host Qatari Team Team coach says Shaheen is not ready to compete despite running 7:43 this year for 3,000m. According to IAAF stats, only 5 guys can compete at Worlds who have run faster than Shaheen (Kenya is only allowed 2 entrants). *World's Most Global Sport - 150 Countries Represented At Indoor Worlds We're still awaiting a full list of US team members. *Compare To Kenya, Who Can Only Afford To Send 6 American-based Boaz Lalang is paying for himself to make their team 7. Paul Koech ran 13:02 for 5,000m indoors this year and didn't make the Kenyan team. *World Indoor Champ Liu Xiang To Defend Title In Doha Against Giants Robles And Trammell We'd say this is good for the sport, as there must be at least a few hundred million Chinese who will draw inspiration from the event thanks to national hero Liu Xiang. Liu isn't in great fitness, but says he just hopes he can make the final. *6,000 Tickets Sold For Doha If we're doing our math correctly, there are 9,000 more tix available over 5 sessions. *Boston And New York Disappointed With USATF Decision To Go With Houston NYRR CEO Mary Wittenberg and Boston Marathon executive director Guy Morse both speak publicly, saying they were surprised and disappointed with the USATF decision. *Good Read: Brief Chat: Boston's Guy Morse Hoped That New York And Boston Could Trade Trials Back And Forth Also find a chat with USATF long distance running head Glenn Latimer. Latimer reveals exactly how and why the new men's 2:19 Trials standard was formed. Recommended Read: Obituary For "Original Thinker" GBR Track And Field Coach Wilf Paish Quote: "Paish's reputation was not founded solely on the achievements of the elite athletes he worked with, but his capacity to inspire even the most modest of performers." It's always important to note that success is not about the end result or the achievements that newspapers laud. It's about the effort, being kind to people, and inspiring excellence through original and passionate thought. *8 Americans Under 63:00 Through February 2010 All in Houston except Trafeh and Morgan. Kenyan Junior XC Champ Charlie Chebet Talks World XC Nobody pressurizes the World XC meet more than the Kenyans! Moses Masai And Vivian Cheruiyot Win World's Best 10k Titles As Masai Picks Up $35,000 For His Efforts Masai ran 27:19 in Puerto Rico on the roads, easily defeating former course record holder Sammy Kitwara. Cheruiyot (world 5k champ) was in a duel with world half marathon champ Mary Keitany. Lel (61:07) Returns To Defeat Sub-Par Wanjiru, Adere (67:52) Wins Close Race Over Kim Smith (67:55) Adere and Smith ran the fastest times ever on American soil. Lel and Wanjiru will square off again in London. LRC Training Talk #5 With John Cook John Cook, the coach of many of the US's top mid-d pros, including World Championships bronze medallist Shannon Rowbury, was our featured guest on Thursday and Cook was his entertaining self throughout. No topic was off limits as we talked about his evolution as a coach, the role of drills and mileage, how not to get stress fractures, how big of a problem drugs are in the sport, and even the departure of Shalane Flanagan and Erin Donohue from his training group. Along the way, Cook also talked about many of the biggest names in the sport, including Abdi Bile, Galen Rupp, Alan Webb, Leo Manzano, Alberto Salazar, Dan Pfaff, Peter Coe and others. Listen to the 75-minute podcast on the left or click here to figure out how to download it to iTunes or to listen to past editions. *LetsRun.com Training Talk Main Page Find all the Training Talks here. LRC Ed Torres Hangs Them Up Foot Locker XC, CU's 1st NCAA XC national title, and 3 US teams to his name. Marilson Gomes dos Santos, Alistair Cragg And Gebre Gebremariam Added To Field At NYC Half Marathon The March 21 race will be streamed live on the internet and will be available to some live on television. Haile G. and Meb K. are among the other top entrants. Good News: Brief Chat With Serena Burla After Surgeons Removed A Malignant Tumor From Her Leg Burla says the surgery went okay and she thanks those who have supported her. 2009 NYC Marathon Champion Derartu Tulu To Race Yuri Kano and Others In Nagoya Marathon Derartu Tulu's surprise win in New York was as notable for her character during the race as it was for the fact that she won. Read about her urging on struggling Paula Radcliffe during the race here. Heptathlete Jessica Ennis To Return From Injury Just In Time For Worlds She'll face American Hyleas Fountain, who was injured last year when Ennis won the world heptathlon title in Berlin. South African Athletics Officials Now Facing Hearings On Wide Range Of Charges Leonard Chuene and Co. will face charges ranging from lying about Caster Semenya to financial dishonesty to physically abusing athletes. (KEN) Kenyans Upset That Women And Men Are Living And Training Together In Sports Hostel It's fine that they don't have electricity or running water, but it's not good that women were discovered living and training with men. (JPN) Japan Running News Gives Us Great Interviews From 12 Time Zones Away - Interview With Arata Fujiwara At His Favorite Bar A good follow-up to The Week That Was, where we give Japanese marathoners a big Thumbs Up. (KEN/ETH) Extended Profile On Kenyan Women Who Turned The Tables On Ethiopians Defar And Dibaba In 2009 A GREAT read on Vivian Cheruiyot and Linet Masai. Look for Cheruiyot to race Meseret Defar in Doha at 3,000m and Masai will go for the World XC title as a big favorite. Masai (above, winning a world title) looks like the perfect runner. (AUS) 800m Training Article - Quotes From Australia's Best Half Milers This article has some mid-d training advice. If you have more mid-d training questions, email us and listen to Training Talk V with top US coach John Cook on Thursday. LRC The Week That Was In Running Feb 22-28, 2010 - This week we hand out praise to underdog US female runners, heavily-favored US male runners, Usain Bolt, Ryan Gregson, Martin Lel, Kim Smith and Japanese marathoners while we give a Thumbs Down to Kenya. Along the way, we wonder why we can't purchase a Mercedes for less than a quarter and then we actually give out praise to the Boston marathon and wonder if they are finally narrowing the gap with London. NZL's Nick Willis and Kenya's Asbel Kiprop both got moved up in the 2008 Olympics after Rashid Ramzi got "Dairy Queened." 1:42.01 man David Rudisha comes up to the 800 after a nice 400, while teenager Ryan Gregson moves down after his 3:35 PR in Sydney on Saturday. Throwers Cantwell And Campbell Win $30k From Visa Thumbs Up to Visa for giving $100,000 in prize money to 6 top American track athletes. But the series needs some work (or re-naming), as in reality it's not a series at all. You earn money based on your best single performance. Two of the women's prize winners (Carmelita Jeter and Debbie Dunn) only competed in 1 of the 3 series events. Bernard Lagat was the lone distance/mid-distance runner to earn money from Visa. He took 3rd and $5000 for his 13:11 American record in Boston and competed in all 3 events. *Congrats To Unheralded Series Winner Amber Campbell (pictured left), who threw the 3rd-farthest weight throw in world history to win USAs. *LRC Also Needs Fixing: Doug Logan And USATF Refuse To Convert Distance Times At Altitude In his explanation, Logan refers to 5,000 feet altitude in Albuquerque as "relatively moderate." Cool New Media: Winter Olympic Musical - Listen To Difference Between 1st and 10th In Olympic Sports Thanks to our friends at Science of Sport for pointing out the site in their own interesting discussion of the tiny (but significant) margins of victory in elite races. Teenage Runner Struck By Car At Night Dies From Injuries Robby Mayasich was handing water to a teammate during a relay race when he was struck. Nike Track Nationals Unveils Website Nike is starting a new meet this year designed to crown an overall high school track champion team. 12 schools from 8 regions will go based on the best marks from their athletes. Your team gets selected to the meet based on decathlon-like scoring and one athlete can only have a maximum of 2 of your team's top seasonal marks in the 10 events. The meet is going to be held the night before the Prefontaine Classic, now a Diamond League event in Eugene. *Old Nike Nationals Becomes New Balance Nationals June 17 In N.C. Individuals could do both meets if they wanted. "The 400 I don't want to do, but I think I'll do it in the future because my coach can be very convincing. And he'll find some argument for me to do it." Usain, how about this argument: you'll be the first man under 43. Watch MJ's 400m WR. NRR - Brittney Griner on OTL...another Semenya? How good is 1:46 flat at 19 years of age? What are some of the biggest running myths?